Transfer by coach from Dijon to Besançon. Passengers are welcome to board our ship at 6.00 p.m. After comfortably settling into your cabins, we'll introduce our crew at a welcome cocktail before dinner. We'll depart by coach to Arc-et-Senans for the tour of the Saline-Royale. Listed as a UNESCO World Heritage Site, this royal factory was built between 1775 and 1779 at the wish of King Louis XV. We'll return on board after our tour and cruise towards Ranchot. This morning will be spent cruising towards Dole. In the afternoon, join us for an original and unique tour, following the "trail of the Perched Cat”. This trail refers the famous tales of a Perched Cat, written be Marcel Aymé who lived in Dole as a child. We'll spend this morning cruising towards Saint-Jean-de-Losne. In the afternoon, join us for a guided tour of the city and the Battellerie Museum which recounts the history of navigation, followed by a tasting* of local products. We'll spend the whole day cruising towards Petit-Ouges, reaching it in the afternoon. Upon arrival in Petit-Ouges, enjoy time at leisure to discover the "circuit of the three washhouses”(1). This morning will be spent cruising towards Dijon. 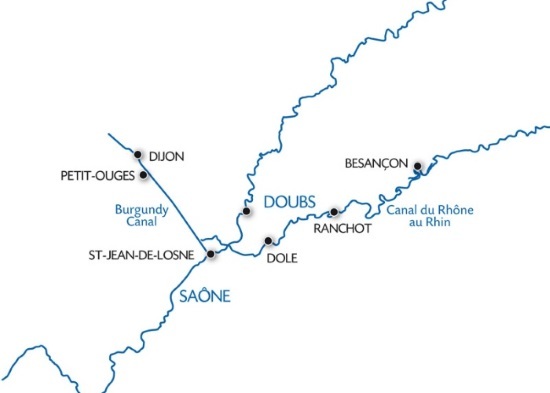 In the afternoon, join us for an excursion along the Grands Crus Wine Route. The touristic Grands Crus Wine Route passes through the finest and most prestigious of the Burgundy vineyards. Tonight's our gala evening and dinner.